Karen Burns-Booth serves up a warming spiced beef hotpot recipe, cooked with dried apricots to add a beautiful sweetness to the dish. Marinating the beef and fruit in the Patak's Madras Spice Pots brings a haunting spice to this classic British dish. A spicy take on a Northern British classic, this Madras beef and apricot hotpot is the perfect dish to serve up for a midweek family meal or for a leisurely weekend lunch. 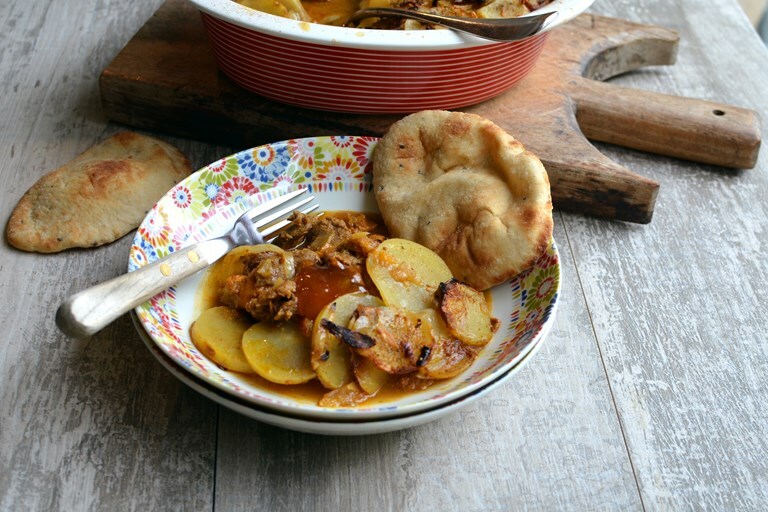 Using Patak’s handy Paste Pots as a marinade and flavour enhancer, along with plump dried apricots, this spicy hotpot is topped with onions and sliced potatoes for a complete meal, although it’s a good idea to serve it with a dollop of mango chutney and maybe some naan bread for dipping and dunking in the delicious sauce. Try to allow the beef to marinate in for at least twelve hours, or preferably overnight in the fridge, as this tenderises the meat and adds more depth of flavour to the hotpot.